Brewery: Dark Star Brewing Co.
Cracking pub. A blueprint for many others I’m sure. Simple layout and furnishings. Great choice of beers in keg and cask. The Dark Star APA was - as always - fantastic and the stout I had was lovely too. Nice to see a full range of styles at these times of the hoppy pale beer dominated offerings elsewhere. I've been meaning to visit here for some time. I finally got the opportunity in mid-October. Luckily the pre-football rush was over. We may have missed the kick off ourselves. But at least the pub was quieter. It's a lovely little single room boozer, which is fairly basic in character. Dark Star Hophead & American Pale Ale were on. Guests were Fyne Ales Monterey Boulevard, Bristol Beer Factory Mischief & Thornbridge Cocoa Wonderland. Ciders were Seacider Medium & Ascencion Company Pilot. 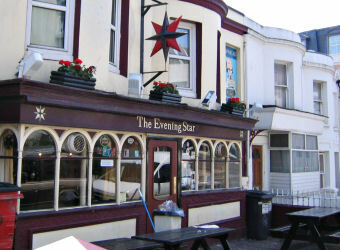 This pub will be near the top of my list to visit next time I'm in Brighton. Fantastic choice of real ales and craft beers at reasonable (for London or Brighton) prices. Only downside was the appalling stench in the gents' toilets! Somewhat over rated good perhaps but certainly not great.Two of our crowd tried the Thornbridge Kipling it was awful,far too cold and I suspect that it had been forgotten somewhere and was close or over date, fortunately me Hophead was good..Cleanliness doesn't seemto be a priority of any kind,the toilets are awfully shabby and whiff the nasty acrid smell of urine.